$11.99 to $19.99 & FREE Shipping on orders over $59 $35. Do you need a low-foaming cleaner to sanitize your equipment? Saniclean is the low-foam version of Star San. Made by the same company that makes your favorite cleaners, Star San and PBW! Saniclean does exactly what you want it to do: sanitize with low foam. It is also known as a flavor and odor remover, making it the perfect choice for acid rinsing your dispensing equipment. With a contact time of 2-3 minutes it is not as fast as Star San, but works equally well. Particularly well suited for recirculation through pumps and transfer hoses. Dilute at a rate of 2oz Saniclean per 5 gallons of water. Use One Step now and like it. Just trying something new. Haven't used this before. Like the fact it creates less bubbles than Starsan. Low foaming for bottle sanitizing. i'm out and use to sanitize/store my cfc so it doesnt corrode on the inside. Great product, I would highly recommend. So much less foam than Star San, a real time saver when using a CIP to sanitize tanks and fermenters. Our go to sanitizing rinse, we use this product to sanitize our gear during the final phase of filtering and bottling of white and or sweet wines. After cleaning and kmeta/acid rinsing of tanks, pump, hoses, filter/housing and bottling station, we rinse it all with a saniclean solution. It is a few minutes of contact, but we prefer the low foaming action of this product. 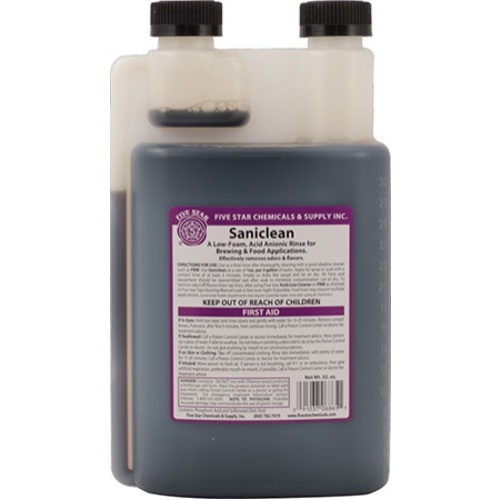 We have used this for several years and have great confidence in Saniclean. Product is cheaper than star san and works just as well. I love this addition to my sanitation regimen. I have begun using this in addition to Star-san and PBW as a final pre-Star-san rinse. I was having issues with low-grade bottle infections for beer competitions and long-term storage and I haven't had any issues since using this.